There is something about the giving away of summer and the entrance of fall. Yes, fall. Not the abrupt jumping of seasons that winter tried to do last week, but the gradual entrance of fall. I look forward to this every year. I for one detest summer. The hot long days of cow work or just the blinding heat that keeps you trapped inside an overly hot house. Ugh! You can’t cook because nothing sounds good, plus who wants to heat up the house even more. I for one am a cooker. I cook for fun, when I am stressed, or depressed, or when I have nothing to do. Okay I always have something to do, so if I am avoiding doing something I should be doing, I cook instead. It is what I do. A terrible habit I must admit! Well fall brings with it my inability to stop myself from cooking everything. It’s time again for cookies, pies, and soups. Oh, how I love to cook a good soup. Plus it is almost time for the holidays and the cooking gets even more intense. Oh I just love this time of year. We have an outfitting business and I do all the cooking. It is so much fun and I cook until I am tired of standing in the kitchen. My poor hands crack from the constant dishes, but it is so darn fun. Well I have leftover supplies that I being back over to my house. This year one of the things I just never used was a two pound bag of pecans. I mean what was I thinking to buy that big of a bag. I hate nuts in anything. They are just odd. Well this morning as I was putting away all the supplies this bag of pecans just kept pulling me. I couldn’t help myself. I usually wait till closer to the holidays, but I couldn’t I had to make the most fabulous thing possible with pecans and in my world quite possible the only thing I make with pecans, Candied sugared holiday pecans. These are so good. Oh I could eat them all. I really could. Over time of course. You must try these. They will be a hit with everyone. Even non nut eaters like myself will be begging you to make more. Trust me do this, do it soon. 1. In a large bowl combine the egg white and water. Whisk until frothy. Add the pecans to the bowl and mix until coated well. Let sit for 2-3 minutes to moisten well. 2. In a small bowl, mix sugar, cinnamon, and salt. Pour over the pecans. 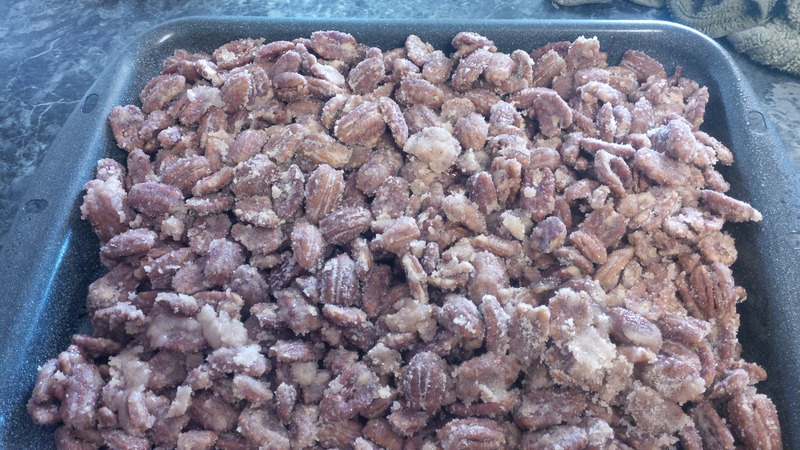 Mix thoroughly until all the pecans are coated with the sugar mixture. Pour onto a greased cookie sheet. Bake at 200 degrees for 1.5 hours. Stir once. Let cool on cookie sheet. Break apart and store in an airtight container.